Rare French 19th Century Casket in Original Mercury Glass decorated with a Delicate Etched Flowers and Dore Bronze Mounts. Marked Maison Boissier on the Dore Bronze Mount and Boissier Confiseurs 7, Boul des Capucines, Paris. Maison Boissier was and still is a Famous Confectioner and Chocolatier Founded by Bellissaire Boissier in 1827 in Paris. It is one of the oldest confectioners in Paris. Their first shop was in Boulevard des Capucines and this box bears that label! 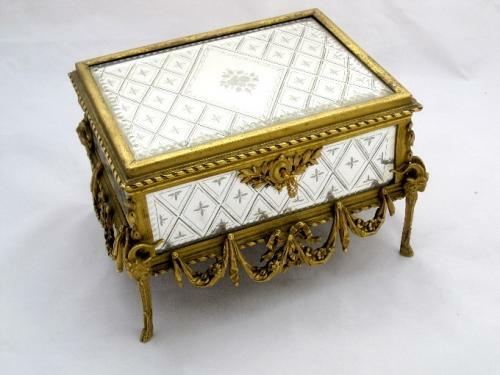 They had shops in the Famous Champs L'Elysee and Place de L'Etoile and were favored by nobles and royalty who would stop their carriages and indulge in their exquisite pastries and chocolates.They were know for their beautiful confections which were placed in boxes of equal beauty like this one.